The market continues to churn in a tight trading range overall. Some currencies such as the Japanese yen (JPY) are strengthening against the U.S. dollar (USD) while others such as the Australian dollar (AUD) are weakening. The U.S. Dollar Index (USDI), a basket of major currencies weighted against the dollar, in fact closed unchanged from the week before. You can’t get much more directionless than that. Meanwhile USDI remains grid-locked within a monotonous eight-month trading range. Consequently, I’m building short positions in USDJPY and AUDUSD while I wait. Because even though the prevailing sideways trading environment continues to grind onward, I believe both these positions (plus a couple other non-USD trades) should pay off over time. The bearish case for AUDUSD (the Australian dollar against its American counterpart) stems from the double top that began forming in July last year. AUD crossed the neckline at the 0.75 level and has been trending downward ever since. More recently, we’ve seen a mini double top form. The long reversal bar that occurred over the Christmas holidays has supported AUDUSD so far but probably not for much longer. This pair is hanging on by a thread at the 0.70 level. I think it should inexorably head lower over time. Just don’t expect any fireworks in the near term. Afterall, we’re in a trading range environment, not a trending one. That’s why I’m building a short position and being patient. Here the bearish case is based on a head and shoulders pattern with a double top forming the head. We’ve since seen a descending triangle. A rounding top that broke the trendline proved to be a bull trap that was very profitable for us USDJPY bears: we took 600 pips after that bear trap when USDJPY plunged over the Christmas holidays. It could have been more but the pair moved so quickly I didn’t have time to adjust my profit target at the time. So what’s next? I think potentially the same thing is ready to happen again in USDJPY. After all, the price began turning after an inside bar. It’s now dropped back down into the descending triangle and should continue lower. It follows that if AUD is weak and the JPY is strong, then AUDJPY (the Australian dollar against the yen) should also make for a great short. That would appear to be the case. We’re seeing a triple top here from which AUDJPY then crashed through the neckline. The price re-tested that breakdown area on a few occasions but couldn’t hold. Now we’re seeing a rounding top in AUDJPY and when you couple the overall downtrend with the triple top I think we’ll see lower prices here over time. AUDJPY is hovering at support right now, but be warned it could slide sideways for awhile yet before descending to its December lows (or even lower). Now for a pair on which I’m very bullish: GBPAUD (the British pound against the Australian dollar). Here we see a triple bottom followed by an uptrend, although GBPAUD is now at a resistance area. The price is struggling here: it sold off and then recovered two weeks in a row. I think we’ll see new highs in GBPAUD, but we’ll probably need to wait a bit longer before this pair can kick open the door and break out to new highs. Look to buy any weakness and wait. Likewise, I expect GBPCAD (the British pound against the Canadian dollar) to also head higher. As with GBPAUD, we see the same triple bottom price action. Then a rounding bottom, which has propelled the price to the current resistance areas we’re seeing now. Last week GBPCAD had an inside bar. An inside bar is when the high and low of the latest week are entirely inside the high and low of the previous week. An inside bar represents a coiling of energy – this of a compressed spring being held down. I expect GBPCAD to release its energy explosively, sooner or later. I think that move will be up based on the price history we’ve seen so far. Due to the overall rangebound environment, it may not be ready to move just yet. But the direction to bet on this one is long. XAUUSD (spot gold against the dollar) is looking a bit more active at the moment. Prices are near the highest part of the month of March right now. I’m interested in seeing how we close out this month for that reason. After all, the price has failed to break out convincingly after the initial breakout from the long-term symmetrical triangle. That’s why even though XAUUSD has crept up from the 1280 to the 1320 price level, I’m increasingly skeptical of this rally. That said, I don’t see any trades in this pair that meet my risk:reward criteria for now. Gold isn’t looking much more encouraging at the weekly level either. There’s very strong resistance at 1360 and support at 1275. Gold is likely to stay rangebound for the immediate future. Any rallies should probably be shorted at this time as the momentum just isn’t convincing right now. In fact, I’d expect a re-test of the recent low before any new high. The stock market is also looking sluggish. Last week’s key reversal in the S&P 500 stock index is likely to cap the huge rally that’s been underway since the beginning of the year. I believe a long-term trading range in this asset class is likely to ensue. We won’t see much volatility for the foreseeable future. Since this bearish key reversal happened near earlier highs, it’s likely significant enough to contain the S&P for quite awhile. We might be seeing a bearish triple top, but more like we’ll see sideways action instead. This is a very bearish chart. We started with a double top, followed by multiple tops and huge bear patterns every time the stock gets to the 360-380 level. There are two necklines of support and TSLA went through the first one 3 weeks ago. Now the next support is at 250. I think we’ll get there soon enough as the 250 target for our short is well in sight. To summarize, it’s worth building short positions in USDJPY and AUDUSD. The yen is winning the tug of war against the dollar while the Australian dollar is losing. Also consider building long positions in GBPAUD and GBPCAD. There’s not likely to be a lot of explosive action in the near term, though. Be patient and wait for the patterns to play out as they should. In the meantime, you can “get the jump” on that potential future announcement by booking a spot at my LIVE 2-Day Bootcamp where I’ll demonstrate exactly how to make trades just like the ones I’ve outlined here, including my “Lazy Trader’s” 5-step execution plan. That’s the one I’ve used to pull in more than 6,000 pips in FX last year and highlight the potential winners I’m showing you today. 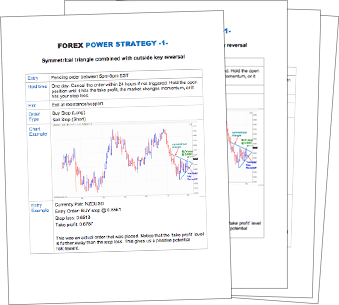 It’s never too early to learn just how well my methods work in the forex market even if things are projected to be a bit quiet there for the next little while. If you’re interested just check out that link. Seats are limited so don’t delay!